In a week the massive Euro tier Livestock and Poultry Exhibition will be held in Hannover Germany. An event that is held every two years. We will be there at the Genesus Exhibition with 23 Other Genesus Associates as we continue to grow in Europe and Asia. 4 years ago at Eurotier there were 4 of us in the Genesus Exhibit. This week in honor of Eurotier we thought a synopsis on the E.U. swine industry might be relevant. Most of the data to follow comes from a report published October 18, 2018 by the Committee for the Common Organization of the Agriculture Markets, European Union (E.U.). After China the European Union is the second largest swine producer in the world. Just about double U.S. Production. Some E.U. countries have no data available. 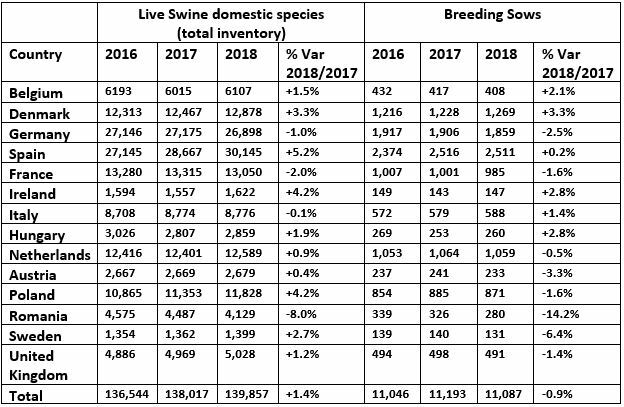 The inventory numbers indicate to us that the industry has been stable over the last three years with both total pigs and breeding sow numbers staying relatively constant. One indicator of market trouble is the collapse of feeder pig prices now at 33 Euro per head, ($38 U.S.) 23% lower than a year ago. This reflects more supply than demand, and is putting large financial pressure on two major feeder pig producers. Denmark and Netherlands. A good price for America but not great for E.U. producers. When we look at individual countries we see that Spain has by far the largest sow herd and total inventory. Over the last ten years Spain has had dynamic growth as the integrator model they employ has worked very well relative to independent producer model of Northern Europe. The E.U. exports more pork than any other area. Over a third of E.U.’s exports go to China. Jan-Aug: 801,191 metric tonnes. China is a big market for E.U. and have done a much better job capturing the market compared to the Unites States. The Market capture has been done despite weekly hog prices significantly higher. Obviously E.U. hog prices are higher, but we don’t sell market hogs into Export markets. We sell pork. We don’t have all the correct data but we expect if we had the wholesale pork cut-outs prices the difference would be much narrower due to the fact that the U.S. packer gross margins have been historically high over the last three years. E.U. packer margins haven’t been as good. Consequently, the pork prices between countries in much narrower than hog prices would indicate.